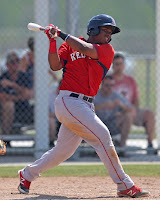 9/9 Cup of Coffee: Salem staved off elimination thanks in part to a big night from Rafael Devers (pictured), forcing a deciding Game 3 on Friday. An exciting season came to an end for Lowell, despite a solid start from Jason Groome. Salem bounced back in a big way after losing the series opener, pounding out 10 hits. Rafael Devers led the charge with a 2-for-4 night, clubbing a two-run shot in the fifth to give the Sox some breathing room. He also drove in a key run in the third inning on an RBI single. Jayce Ray kicked the scoring off in the second inning with a solo home run. Trey Ball came through in the clutch, picking up the win with 5 2/3 innings of solid work. He allowed just one run on three hits while striking out three and walking two. Myrtle Beach was able to bring the tying run to the plate in the bottom of the ninth, but Jamie Callahan staved off disaster to earn the save. The best-of-three series is now tied at 1-1, with the deciding game three scheduled for Friday. The Spinners' season came to an end on Thursday after a four-run sixth inning by the Renegades proved too much to overcome. Top draft pick Jason Groome was solid in 3 1/3 innings of work, allowing just a solo home run and two hits total. He struck out three and walked two. Kyle Hart surrendered four runs in the Renegades' rally, however, taking the loss. Ryan Scott went 2 for 4 with a solo home run and two runs scored. Tyler Hill, who went 1 for 5 with a double, came up in the ninth with the tying run on first but flew out to end the game. Hudson Valley swept the series, 2-0. Player of the Night: Rafael Devers picked the perfect time to come up with his first home run since Aug. 11, helping keep Salem alive. Including the regular season, it was Devers' 12th homer of the year. Devers has driven in four of Salem's six runs scored so far in the series.